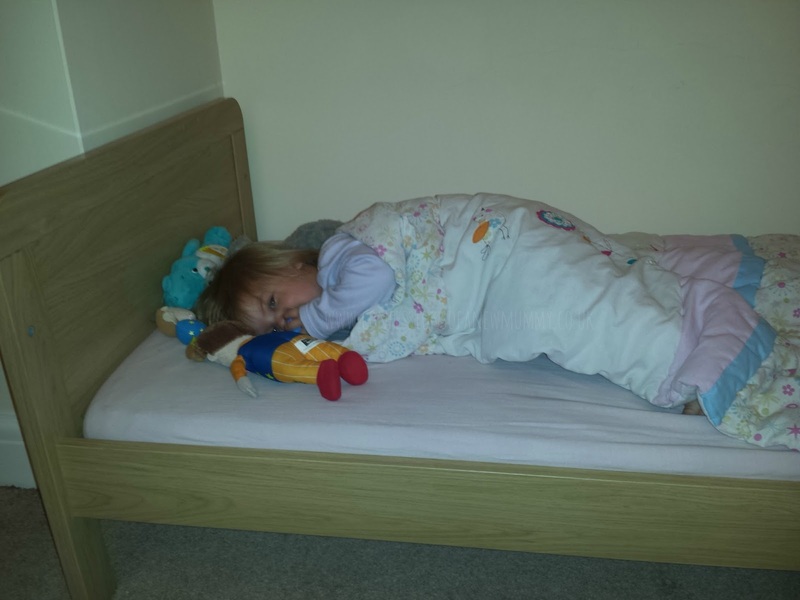 Bye Bye Cot - Hello Toddler Bed! Whilst T and E were sharing a bedroom, I was reluctant to move T from her cot and into the toddler bed. I had visions of being woken at 3 in the morning with T trying to climb into bed with E and E being grumpy (rightly so!) about it. So I put it off, as you do. Or as I do! With them now in separate bedrooms, it was the ideal opportunity to make the move. Not a lot seems to bother T so I wasn't worried about doing it, just unsure that she would stay in there! That's right. 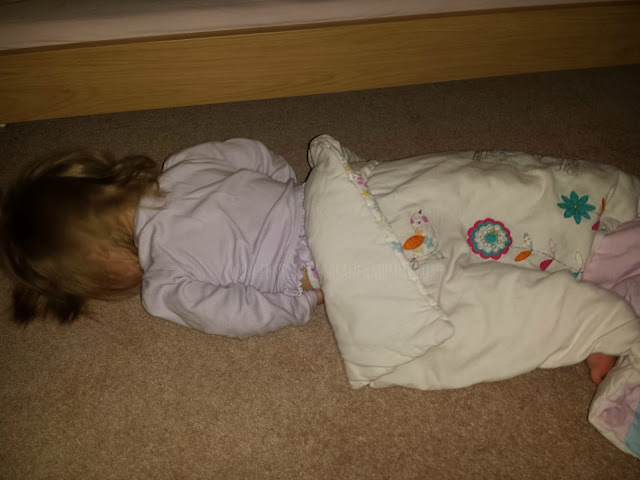 She'd fallen out of bed and gone straight back to sleep! Of course I had to take a picture before I picked her back up! After this, I popped some pillows beside the bed in case she fell out again and that seemed to do the job. Needless to say, the next night I made sure to put the side on. Its been hard to judge with both the girls being full of cough and cold but I do think she's been sleeping a little better too. It might sound a little daft but I do miss seeing the cot in her bedroom now but I'm sure - I hope - that'll pass. For the first few mornings, it was almost as if she was worried about getting out of bed as she was staying there and calling through to me. That didn't last long though. Now she stands at the gate, gradually calling me quietly and then getting louder and louder - I don't really need an alarm clock now!